This is another fun quilt that I was able to make lately. 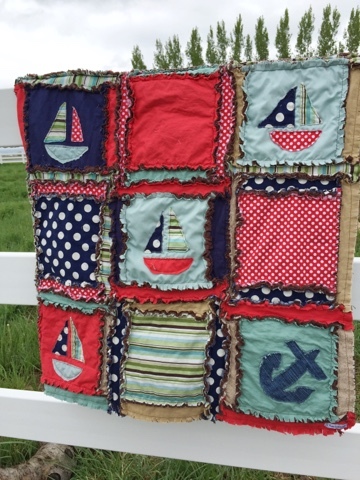 It is a nautical themed one in Red, Navy Blue, Tan, and Seafoam Green. 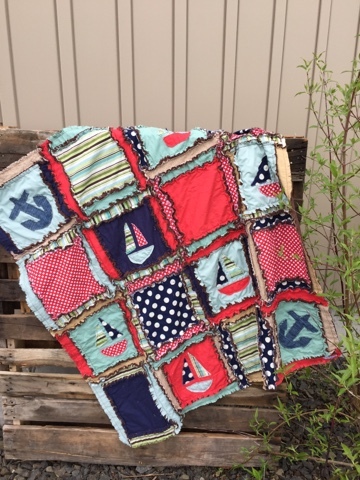 It is definitely not your ordinary novelty themed quilt for a baby boy. I love that it has a modern take on a very ordinary theme. This quilt measures approx 44"x44" and is a great baby blanket size. This is a smaller version of the same quilt above. It measures approx 33"x33" and is considered a small baby blanket or stroller quilt size. 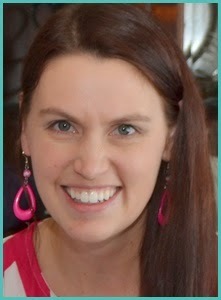 I seriously adore all things polka dots. They are so classic and timeless, but the quilt is still fun and not the same old frumpy bedding that we are all so used to seeing! One thing that I do for EVER custom order, is that I send a picture of the quilt laid out on the ground before being sewn so that I can send it to the customer. That way if there is anything they want changed or switched around I can do it at that point. Most of the time I never need to make any changes, but there are those times that it is so nice to be able to have that communication with the customer. I can't tell you how many times I have created something completely new, and AMAZING just from having the customers input. It is definitely a collaborative process. The larger quilt can be purchased HERE and the smaller HERE. 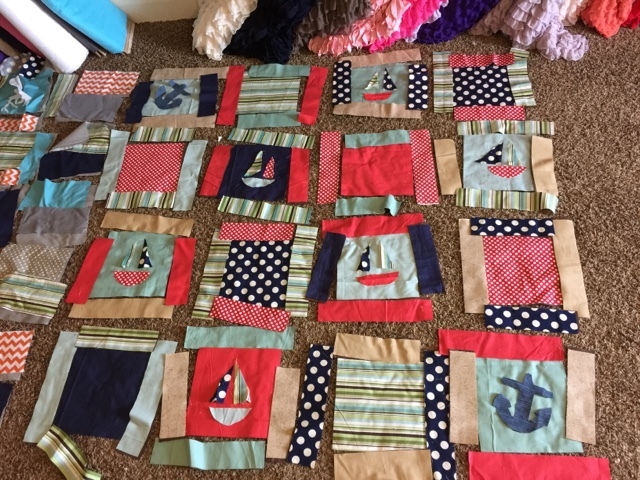 The pattern that I used is the Airplane Rag Quilt Pattern but I switched out the appliques and free hand cut out the sailboats.